Located behind the Oxford Academy Primary School at the corner of West Park Street and Grays Heights Road, Oxford, NY. Private men's and women's changing areas, showers, and lifeguards on duty make for good clean, safe fun. Make an afternoon of it by bringing a picnic lunch and eating in the shade of the outdoor pavilion. 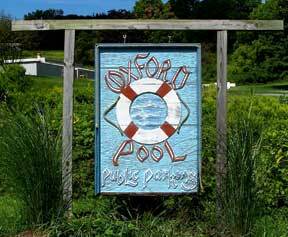 POOL HISTORY: The Oxford Swimming Pool and Bath House was dedicated to the youth of Oxford in 1978 by the Oxford Recreation Association, the Town & Village Boards of Oxford, and the Citizens of the Community. The picnic pavilion was donated by the Oxford Rotary Club. In 2008, the pool's 30-year-old feeder pumps, electrical work and concrete surface were brought up to code. The pool is managed by the Town of Oxford Land & Water Conservation Fund, a cooperative project of the National Park Service-Department of the Interior & the NYS Office of Parks, Recreation and Historic Preservation. Interested in applying to be a lifeguard? Please see this form (PDF). At any time Lifeguards reserve the right to request any person to leave the premises if they refuse to comply with directives and their actions are dangerous to themselves or others in the pool.